December 1, 2018 – We are excited to announce a new team member to the Stars of HOPE family. Stephanie Wray ATR-P, LMHCI, YYT will assume the role of Stars of HOPE Program Manager. Stephanie joins after consulting as an art therapist and volunteering on multiple projects over the past year, connecting our mission with like-minded organizations and sharing her insight into therapeutic art. Wray comes to the team as an art therapist, mental health counselor, and yoga instructor. Her unique training in the expressive arts brings another dimension to understanding the long term healing model of the Stars of HOPE mission. Over the last 25 years, Stephanie has worked as an artist, expressive arts facilitator and educator to bring healing and the arts to multiple populations. Stephanie currently teaches at the University of Tampa bringing knowledge of Art Therapy and Arts in Health to undergraduate students. 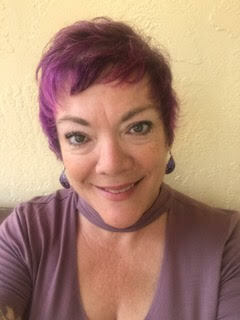 She is an active member of the American Art Therapy Association and has presented three times in the last two years at the National American Art Therapy Conference. In addition, she is president-elect of the Florida Art Therapy Association.